1) Screen Golf - Screen golf is the perfect mix of reality fixed with electronics. 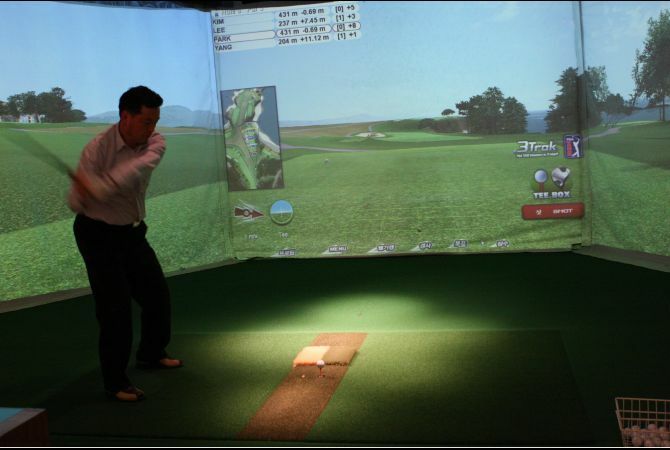 With screen golf, similar to those in the U.S., you use actual clubs and aim at a virtual screen. The computer helps measure how fast and how far you have hit the ball. It calculates wind speed and helps give pointers so that you can improve your game. Some places let you pick what world-class golf course to play on. Especially when the “yellow dust” comes in from the East, if you want to play golf, screen golfing is the best. 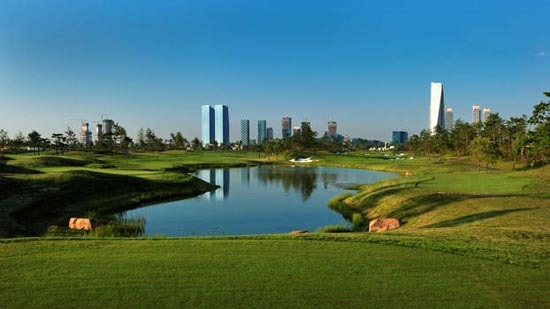 Prices vary from location to location and usually fall in between 20000 to 30000 Korean Won for 18 holes. 2) Driving Ranges – If you are on top of the right mountain in Seoul, you can see a bunch of golf driving ranges below. By my home, I have 3 within walking distance. So this may not be 18 holes, but you can at least practice your swing. When I was living in Las Vegas, my buddies and I would go to driving ranges located on the Strip. For some of my friends, it was a great way to relieve stress. For me, golf increased my stress! But in these driving ranges, there are no holes that you can put the golf ball into. Just targets. Some driving ranges are completely indoors. 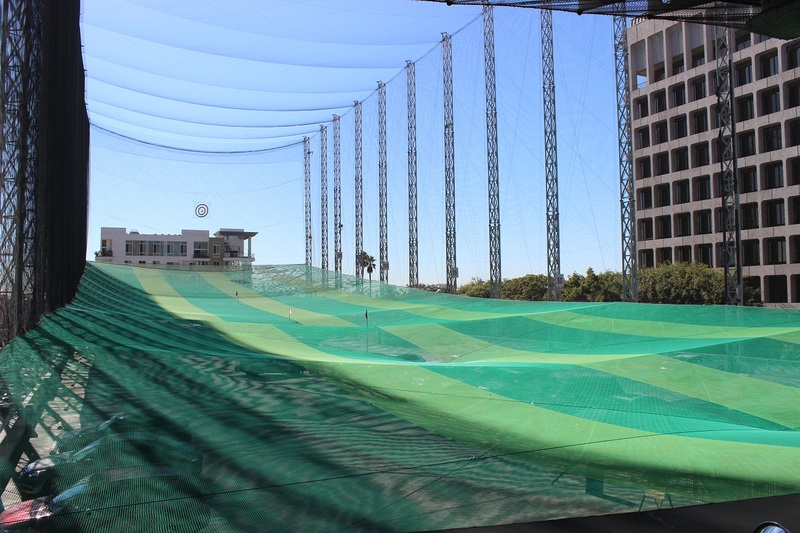 Basically, you are hitting the golf ball into a long green netting. And in some indoor facilities, the ball automatically pops up on top of a tee ready for you to hit. I was extremely shocked by this. Again prices vary and we were lucky to go in on a free weekend. Usually, a membership fee is required along with hourly game play. If you were wondering, the ball bounced off the left tree in front of us. Nonetheless, even golfers take this seriously. No time to laugh or slow our game down because people were coming up from behind. Great place for dating and 9 holes was only 6000 Won. 4) Golf Course – Talking to my boss, he said golfing in Korea is super expensive. He said membership costs were more expensive than those in the states. And then to play a round of golf, it costs somewhere around 250000 Won. My dongsaeng whose major is golf, says his costs around 150000 using his student discount. That said, prices like that deter me from going on a golf course. But you can do what many Koreans do: go take a vacation in the Philippines and play there for less. When I went to the Philippines this past December, I ended up sitting with a golfing tour group of 80 Korean businessmen. They said that golfing in the Philippines was way cheaper than playing in Korea. If you want to play in Korea though, here is a list of golf courses in South Korea that non-members can play on. It seems no matter where you are, golf is always going to be an expensive sport to play. Luckily for those who live in Korea, we have plenty of other options. After working for five years in banking, Marc decided that it was time for a change before he got too old. He left the stress from his 9-5 job to do something new and different. After coming to Korea with a group of buddies, he landed in the Gangdong Branch in Eastern Seoul. When he's not teaching and doing head instructor duties, he is out about traveling Korea, looking for the new, old, and undiscovered places to visit.